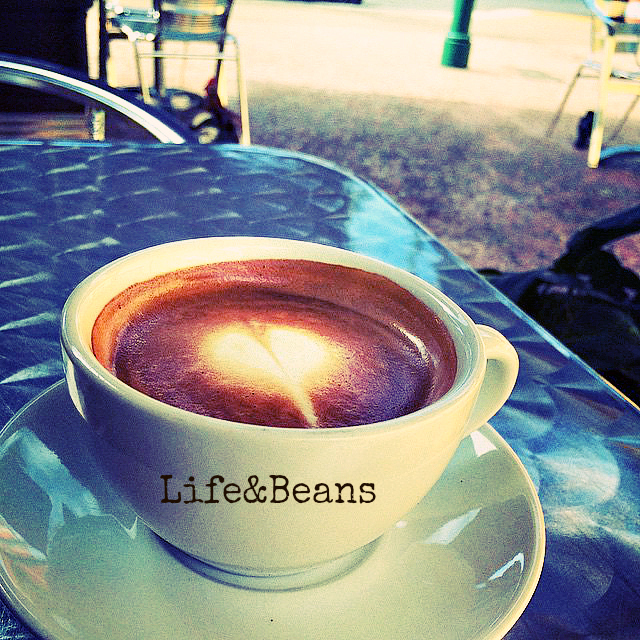 Life & Beans – Recent accounting graduate figuring out life while cooking. Recent accounting graduate figuring out life while cooking. 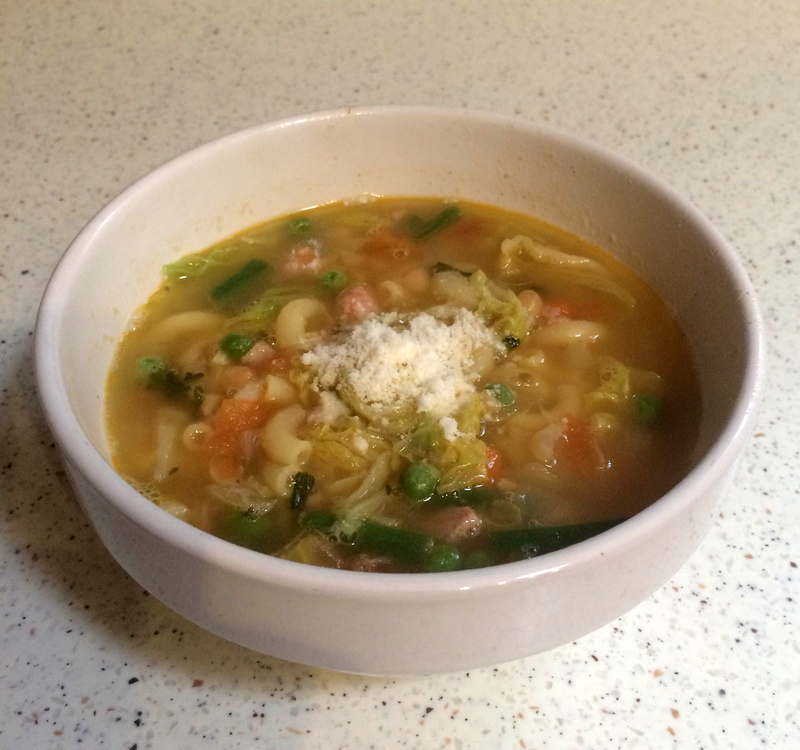 I don’t know if this qualifies as a Minestrone Soup, but it tasted really good. It was a cold rainy day and I needed a nice brothy chunky soup with lots of vegetables. I did it with what I had on my pantry and fridge, meaning that you can use whatever you have and adjust the recipe to your liking. 1.5 inch of Parmesan Cheese Rind ( You know, the end part of a parmesan cheese wedge, this is optional.). In a pot, drizzle about 2 tablespoon of olive oil and add the ham, onions, celery, chopped garlic and tomatoes. Sprinkle the paprika and the italian seasoning. Sautée the veggies for a couple of minutes. Then pour the broth, the beans and add the parmesan rinds (if using). Bring everything to a boil, add the pasta. Then reduce to a simmer and add the green beans and the frozen peas and carrots. Let it all cook for 15 minutes, or until the pasta is done and about five minutes before serving add the cabbage and adjust the seasoning. Serve with grated parmesan cheese. 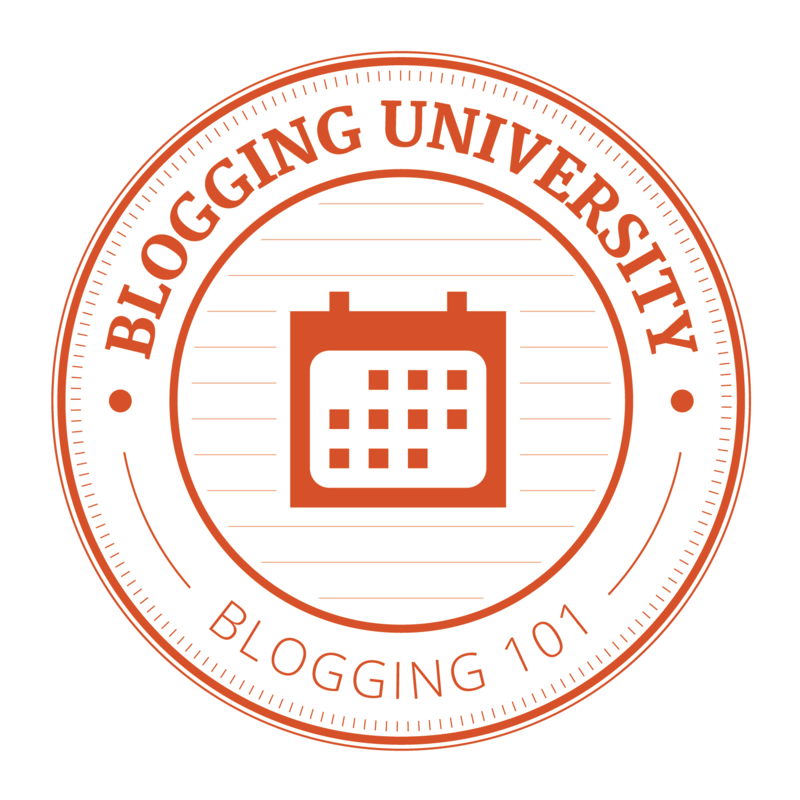 I am just beginning to scratch the surface of this blogging word. But the possibility of sharing my interest and learn from other people around the globe thrills me. For you that casually step by this digital corner welcome. If you are interested in anything about cooking and food: Welcome! If you have an intimate relationship with coffee: Welcome!!! (and let me tell you that here in Puerto Rico we have the best beans!!). I want to share with you what I like to do, family recipes, recipes of my own or ones that I find through the internet. Join me and let me know about you. This is a quick post for an easy and flavorful side dish. 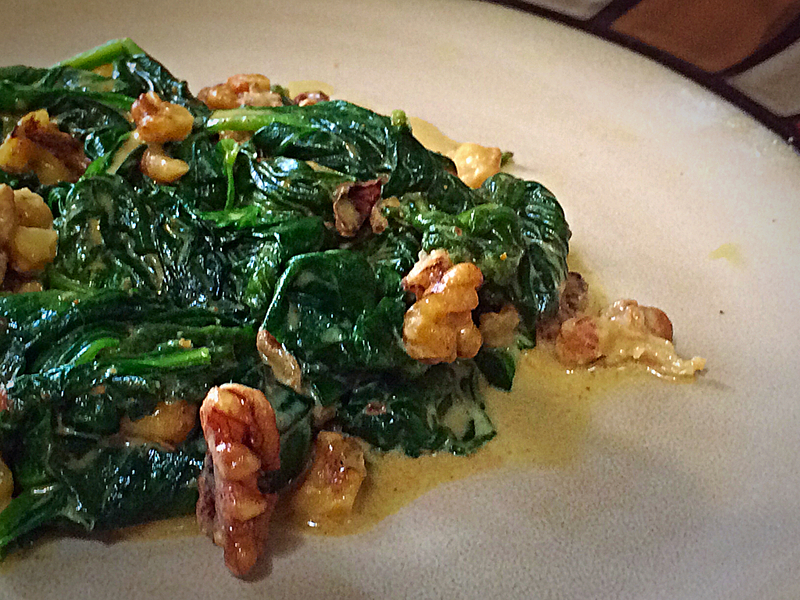 The key is try not to overcook the spinach, as soon as they are all wilted they’re done. In a pan melt the butter and add the walnut, toast them for about 1 minute. Mix together the coconut milk with the curry powder and add them to the pan. Add the spinach and keep tossing them until wilted. Sprinkle the salt and sugar, taste to make sure all is correctly seasoned. Serve! Christmas is the season of giving, reunite with the family and catch-up with friends. Here in Puerto Rico the Christmas time starts on Thanksgiving day until mid-January, so we still have a couple of parties to attend =). Every get-together has to have food and this carrot cake is a perfect end for all your holidays dinners. Also works great with a good cup of coffee and a good friend. The sweet and moist cake combines perfectly with the tang of the cream cheese frosting. The cake batter is enough to fill three 9 in. cake pans, although this last time I used a 9 in. spring-form pan and made another 9×13 in. loaf pan with the same amount of batter. 1 1/2 (8 oz) Cream Cheese packages, room temp. Preheat the oven to 350 degrees F. Spray the cake pans with non-stick spray and flour. 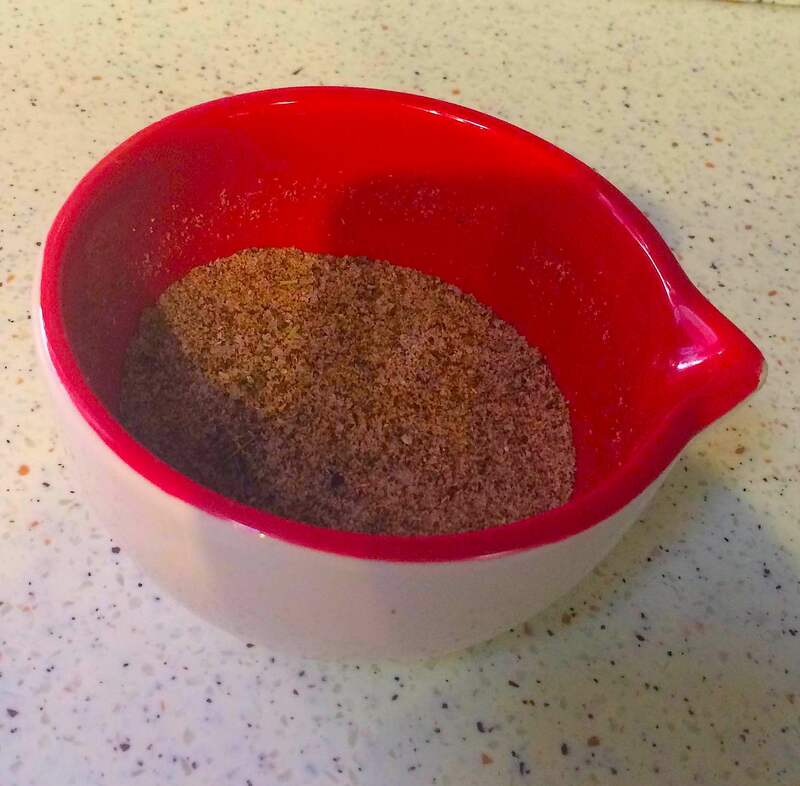 In a large bowl combine the dry ingredients: flour, sugar, baking soda,cinnamon,ginger and salt. Mix them and reserve. In the bowl of the electric mixer add the eggs, oil and vanilla extract. Blend until well combined. 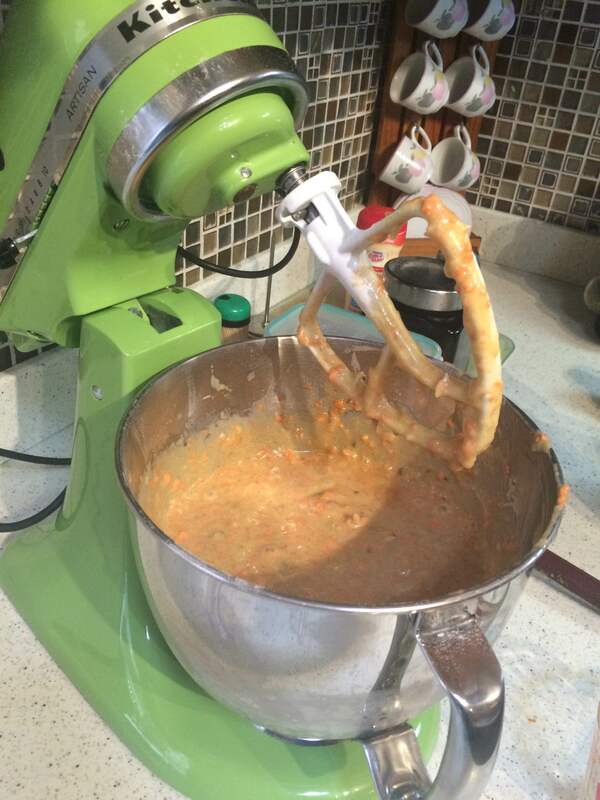 Put the mixer on low speed and add carefully the dry ingredients into the wet ingredients in the mixer bowl. Scrape the sides of the bowl when necessary. Add the carrots, coconut and walnuts and mix well. Pour into the pans until 3/4 full. Bake for 40-50 minutes or until a toothpick comes out clean when inserted in the middle of the cake. Allow to cool. Mix all the ingredients until fluffy using the wired attachment of the electric mixer. When the cake is cool and removed from the pan, spread the frosting all over the cake. 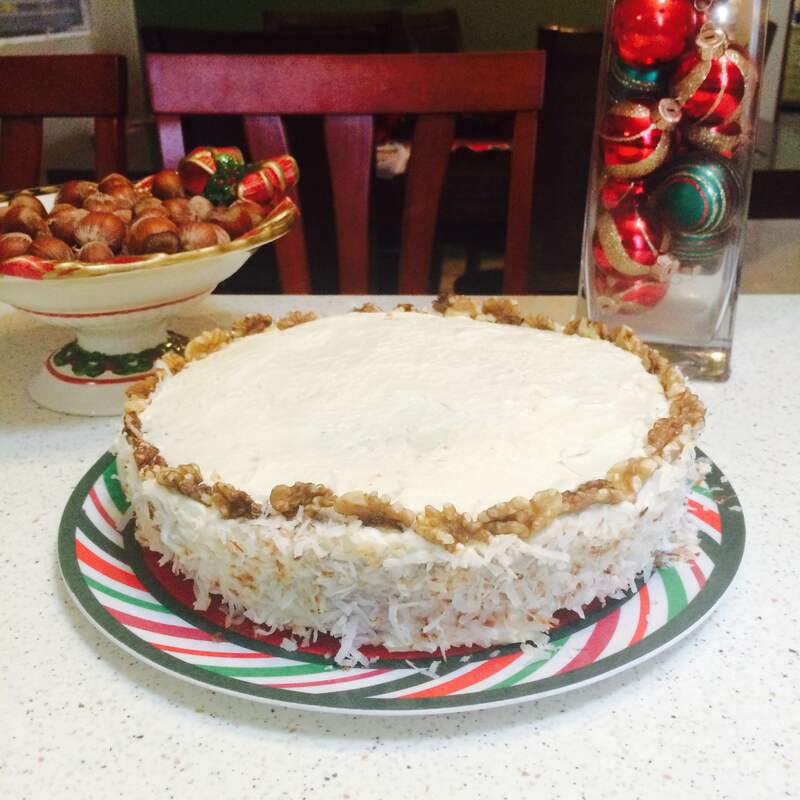 Decorate using toasted shredded coconut and chopped walnuts or anything your imagination decides. 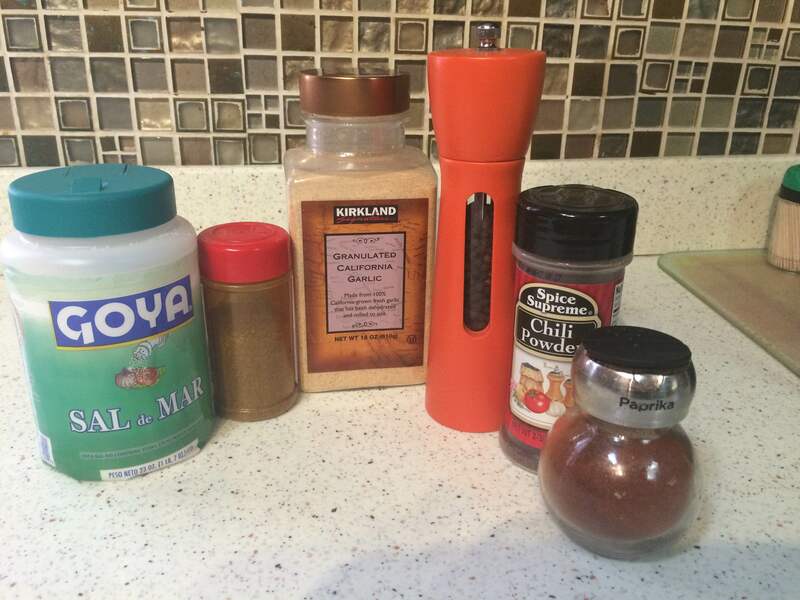 The first recipe I want to share is this all purpose seasoning. It goes well with any kind of meat and seafood. Also adds a nice flavor to soups and stews. This recipe is my basic seasoning and depending on what I’m cooking, I add more spices and herbs. i.e. cayenne pepper, dried parsley, oregano, etc.